I started college as an art major. I’d even won an award in high school (the Big 8 Conference First Place Award in Art, to be exact) with a pen and ink sketch I’d drawn for my dad of a steam engine, and I loved creating, whether it was with words or paintbrushes. At eighteen, I’d wanted to do it all — write, paint, draw, decorate — with an ambition of changing from an art major to architecture or interior design. I’d done well in an interior design elective my senior year in high school too, and somewhere there exists my elevation and samples for the New York flat I’d imagined myself living in one day as a writer/artist/architect/designer, inspired entirely by Bill Murray’s apartment in Stripes. Don’t remember it? I can tell you there was a brick wall and a lot of macrame and somehow my A+ 1989 elevation looked like a late seventies commune smelling of tofu and rope sandals. Flash forward a few years (okay, okay, decades), and here I am, in my third round of treatment for metastatic breast cancer. 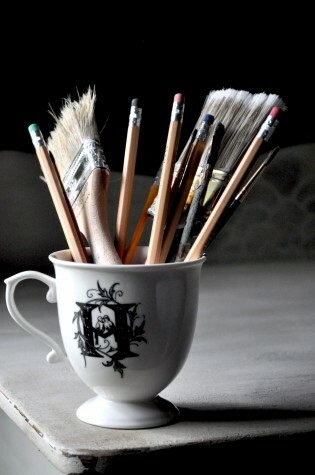 I’ve found myself once again wanting to do it all — writing, painting, drawing, decorating — and I’ve attacked it with an increasing obsession you can read about here and here. It’s therapeutic, I suppose. It’s a distraction from all things cancer. It’s satisfying solitude and hard work and triumph in visible, measurable increments. And now that my house has become cramped with movie-themed artwork on up-cycled wood and refinished buffets and dressers and the like, I realized it could be something more at the same time. It could be a little extra income to help with all the medical expenses. So that’s how Writer By Day Designs came to be. Check out refinished furniture here and movie-themed artwork here. Direct any requests for custom work to cynthia (at) cynthia hawkins (dot) net. Thank you!